Mec-Gar 1911 Officers 6 round .45 ACP magazine with the nickel finish, a flush fitting welded metal baseplate and a captured metal follower MGCO4506N. Now you can use the 8 round 1911 magazines in the 1911 Officers giving you an 8 round magazine with a finger grip. Below is some information on the X-Grip and I have more information in the X-Grip section. The XGRIP 1911c 2pc is a NEW magazine adapter offered by FDI for the 1911 compact. 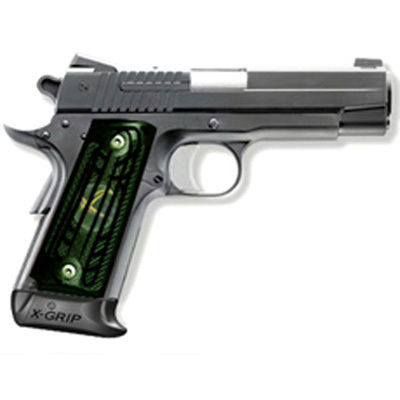 The XGRIP 1911c enhances the versatility, look, and feel of the gun.